Looking back on the three weeks placement, I definitely feel like I have learnt a lot, both academically and personally. For example, I feel like I learnt a lot about myself in terms of being able to organise things and having contingency plans if things didn't turn out properly. The number of trains that we had to take for the entire placement ended up at 12, which I thought was crazy. So if I wasn't going to learn a thing or two about public transport at that stage then I never would. It was an interesting challenge to say the least trying to navigate our way around a foreign country but I never really felt that I wasn't safe or in control which I think was great. The board game project in Villila Studios was pretty interesting, and also different from our course work back in GTI, but it was a welcome change of pace. Being able to observe some of different classes and departments in Ingman college was great, it gave us the opportunity to interact with the students and ask them about their work, as well as tell them about our course in Ireland. Coming back to Ireland was such a change! I certainly didn't think I'd have to break out my snow boots so soon! I feel like i'm able to approach challenges with a more open mind. I also had a really good time meeting people from other cultures, and my teamwork abilities were definitely improved from working with other people to complete our board game. 1. What is your official title? What is your role within the museum? 2. Do you think that Pori Art Museum shows work that is pushing the boundaries of what art is? Why is it important to show this kind of work? 3. What Place does painting have in the contemporary art world in your opinion? 4. How does the Maire Gullichsen collection relate to the work that the museum is acquiring now? 5. Do you have a favourite piece of work from the Maire Gullichsen collection? 6. The museum interacts with children in many different ways including tours for children and the baby colour workshops. Why is it important for the museum to interact with young people? 7. Why is it so important for museums to keep archives? 8. The museum has thousands of books in its archive. How are these books used By the staff of the museum? 9. Where would you like to see Pori Art Museum in 10 years? On our first day at Ingman College we were greeted by the Student Councillor Niina, she kindly welcomed us to the college and talked about its history, what it was and how it became a college today. She then gave us a tour of the grounds and facilities. The grounds have 4 buildings, each with their own uses and faculties. The main building held a cafeteria, Pc labs, weaving and print making rooms. We were then shown to our first workshop, Audiovisual Communications studies; in this workshop they mainly do web design. In the class we introduced ourselves to the tutor and the students; we talked about what we do in college back in Ireland, Animation and drawing. We then talked about Ireland, its history, its locations and people. The students were very interest it our stories of Ireland, they asked us questions and we answered, we had shown our college GTI on Google maps and some nearby landmarks to give them a picture of the area. Next time we have a workshop with the teacher Jouni, he will give us an assignment to do while we are here. Our second workshop was similar to the first. We introduced ourselves, our college and Ireland. After the introductions we were shown some previous students animations, which all had their own personal style. The tutor, Taina, will also give us an assignment while we are here for the week. Afterwards, we sat in the cafeteria and talked to some more Finnish students that were interested in us, we talked more about our home countries to each other. For the rest of the week Amy, Tara, Cat and I were going to be split up and live in different homes around Kuopio area, Amy and Tara will continue to live with Outi, Cat with a Ru and myself with Noora in Kuopio. The people who we're now staying with are also going to be our guides. One of the students, Teemo, was also going to be showing us around Kuopio during week, and they had a list of activities for us to do while we are here. Before our first after college activity, we were to meet with Patsy in Kuopio. He used to teach sports at GTI and was over here checking up on us students. It was really nice meeting him and his wife, he treated us all to coffee and sandwiches at a local cafe. While in his company we shared stories and experiences of our time in Finland. After we left Patsy we made our way to Kunnonpaikka hotel. The sauna itself was located behind the hotel, by a frozen lake in a wooden shack which had an ice hole close by for dipping. Going from extreme heat in the sauna to extreme cold outside and dipping in a pool was an interesting experience. It was really enjoyable, and would recommend to anyone to try it at least once. What a day! We got up to a load of stuff, I’m exhausted! We all got up around 10am and started working on our sketchbooks. It was really nice, and the view from the kitchen window was amazing, so I drew that first. Then I drew the cat, it’s so nice to be around house pets again after two weeks. Once we had breakfast and set off, Outi showed us around the area a little. She offered to bring us to meet some reindeer, so of course we were eager to go. It was so strange seeing reindeer in real life, they’re like a cross between a camel and a rabbit. We fed them some lichen and took some great close up photos, it was a magical experience. Then we went rally car racing. It was one of the best things I’ve ever done. I was terrified at first but then I was having great craic zooming around. I had mentioned to the driver that I might be a bit nervous and asked him if he would stop if I asked... he just laughed. I didn’t have to ask him so that was great. (I like to think he would have stopped for me though). After that, we made a campfire and roasted sausages, and they were delicious. In the evening we relaxed for a bit, then Outi took us for a walk to look at the stars. They were so clear, I could see Orion’s Belt, The Big Dipper and Cassiopeia. Then we all went home and went to the sauna. I’m still getting used to them, they make me really sleepy. On reflection of the trip so far, I definitely think that this experience has helped me grow. At this point in time i’ve taken 8 trains and countless buses, so it’s really boosted my confidence in terms of planning trips both in and outside of Ireland. In terms of my work, it was really great to be able to make a board game, as it’s not something i’ve ever really thought about before in terms of actual construction, and I can’t wait to draw from nature here in Kuopio. It’s definitely made me more inspired to delve back into landscape art when I get back to Ireland. I’ve met so many people here of all different age groups, so it’s been interesting to see their differing views on Finland and Finnish culture, like sauna, food, education and past times. Yesterday I started my day by visiting the Rosenlew museum in Pori. It's in the industrial side of Pori and tells about life in the production factories in the 1900's. I learned a lot about Finnish history and I got to see TV ads from the 1950's, an old diving suit and lots of products which were interesting to look at. After that I got some lunch and spent the rest of the day taking pictures around the city. I like taking different routes to find unusual interesting things. There aren't too many tourist attractions here so it's easy to see the little things such as icicles on gutters, small tags from graffiti artist and general 'mundane' objects in the city. I started off my day today by looking around the open storage where they keep the big sculptures. The staff are currently moving around and organising things and as I was walking through I realised I wasn't sure what was art and what was the staffs equipment. Some of them are obvious like the big gold man with blue boxing gloves. I've seen it in the corner of my eye a few times, lurking on a shelf and it always makes me jump. The sculpture storage is a mess and not for ack of organisation. None of the works make sense next to each other and there are unusual shapes and objects everywhere. It's really a different experience to seeing sculptures in an exhibition space. Then I did some drawings of the interior of the building. My main interest in my work has always been colour and i've noticed that a lot of contemporary work has very minimal colours if any. I've decided to start noticing what colours are in the museum on the walls, on the furniture, the bookshelves, the floor etc. ​I must say, we're getting pretty used to the rhythm of the early mornings and long train journeys. We were up bright and early this morning, with some last minute scrambled packing as we set out for Kuopio. Unlike our first train journey from Helsinki, however, this one went much more smoothly. After 3 trains and 5 hours, Amy, Derek and I finally arrived, where upon we met our new host Outi. She was kind enough to take us to a cafeteria so we could get some lunch while we waited for Tara to arrive from Oulu. We were famished and quite a bit tired at that stage so the food and coffee was a welcome pick-me-up. After picking up Tara we went back to Outi's apartment to drop off our luggage and then headed out again to take a little tour around the countryside. It was absolutely stunning and completely different to anything we'd seen in Pori over the last 2 weeks. The snow was at least a foot and a half deep and completely blanketed everything, including a hefty layer on the roofs. You'd never see anything like it in Ireland that's for sure! Outi also took us to one of the local supermarkets where we could buy our own food and once we arrived back at her apartment we all set about making our dinner. We made chicken (and vegetarian) curry with rice and it was pretty tasty if I do say so myself. As a relaxing end to our eventful day, we had a nice sit in the steamy sauna, which apparently is a common occurrence in Finnish homes. Imagine having such a luxury in Ireland! Today started the same as the others, up early and we made our way to the bus for the journey to Villila College. We continued to work on our board games. Each of us had our different roles in creating it. I'm doing my best to get much work done as possible, creating cards, the game board design and the game rules. For my groups board game, it features a lot of artwork on the cards. So far I have done 9 out of a possible 60 game cards, and I had only started the artwork this week. I'm afraid we won't have time to do them all so we might try and simplify them as best we can. The game rules I created are fun and fair and require some strategic thinking. A month would be a perfect amount of time for this project to be completed especially the one my group designed. Our game would be a mix of snakes and ladders with a hint of 'Magic the Gathering'. We are one day from leaving Villila and I have enjoyed my time here. It is really nice to see how a college in a another part of the world works. The people can be very quiet and shy, just like myself. I will be sure to tell my classmates back home in Galway about the college and what it was like here. After the classes we went back to Pori hostel and waited for our Finnish guide- Suvi, to bring us skiing! She had organised a trip to the local Skiing slopes for us all. The media students were also coming which was a nice surprise, more the merrier, especially people from Ireland that can share the embarrassment of falling. Skiing was tough, you really need strong arms and legs to be able to move on skis properly. We all made it to the baby slope that seems small in retrospect, but it wasn't those that never skied before. I didn't fall on my first try which i'm proud of, but I did fall twice. In another instance I slowly went backwards into a small ditch and couldn't stop myself, humorous for anyone that saw it! After we finished skiing we went into a small hut nearby which had a fire pit in the centre and we could cook marshmallows and sausages. It was a wholesome experience and really enjoyable day overall. We parted ways with the other GTI Media students, the next time we will see them will be back in Ireland. Suvi then returned us to the hostel and this was also the last time we will see Suvi on our trip to Finland, we said our goodbyes and farewells to her. She was a great help during our time here and she was ready at any time to help us if we needed it. In the hostel we rested up after the long day and tried the sauna once more before we depart on Saturday. Yesterday I went to the technology centre of Pripoli with a curator and two technicians of the museum. We were there to hang and remove some paintings from the Pori City art collection. I really enjoy the decision making process of where to hang paintings and which ones to hang together. I was amazed at how fast the technicians could hang the paintings and how straight they could get them on the first try. For hanging bigger paintings they had a laser that projected a grid on the wall so that they'd know where to make holes. Today I spent the morning preparing invitations for the new exhibitions and events coming up in the museum. I put 4 cards and 2 leaflets into each envelope and I packed approximately 200 today. It sounds like a nightmare of a job but I actually enjoyed it (only for a couple of hours). It put me into a meditative state and thoughts started flowing. I was thinking about the role of the cafe in art museums and in art in general which I will investigate further. After lunch I went into the room where the Maire Gullichsen collection is kept in hope to find two Unto Pusa paintings. There wwas too much clutter on the floor to take any paintings out but to my luck one of the paintings I was looking for was already out! It's such a unique experience to see paintings in an archive room, off the white walls of the gallery. It lets you view the paintings completely independent of any other piece of work, exhibition title or information leaflet and let's you see them on their own. Derek and I found a couple of cheap plastic sleds courtesy of our new friend Tomm and we've been enjoying them at the local park. It's about 1 degrees so the snow is beginning to melt unfortunately. Any Finnish person I've talked to about snow has told me that each year it's warmer and warmer and there is less and less snow. It's extremely sad to be experiencing the affects of global warming. I have been reading up on environmental art which Pori Art Museum is a fan of. I want to know how art can influence people's behaviour in relation to climate change. In college on Wednesday, Amy, Cat and myself continued to work on the board games, the rest of the class had to take a regular class. We are making progress, I began to draw artwork on some cards. This is a timely process and I hope to have a good amount done. The rest of my group have been working away on the box art during the week and one of them was also trying to do the game board as well. We will probably decided on the best one at the time of printing. We returned to the hostel only to rest for a while til we were gathered by or Finnish guide Suvi. She came and picked us up to bring us to a special French/Finnish dinner event that was organised for all foreign exchange students in Pori area. When we arrived we were shown to the kitchen, as we were needed to help prepare the meal, this was part of the experience. Upon entering we saw that the Media students from GTI were hard at work, Jon our Media teacher was also present! They had arrived much earlier and were given a bigger task than us, we had to prepare the salads... We chopped different fruits and veg. This was an interesting experience for the me as I had never worked in a working kitchen before. It was calm but a small part of me was afraid it would turn into Hell's Kitchen, but of course it was always going to be calm and a pleasant experience. We then prepared the meal, and at the near the sitting area a few kind words were exchanged between, a Finnish, French and Irish teacher to everyone that was there for the very welcoming dinner. We sat around for a while chatting and catching up on our adventures in Pori and then headed back to the hostel to sleep and be ready for another day at Villila College. Visit to Tampere..and familiar arrivals! OnSaturday we were recommended to travel to Tampere for the day to check out some of the museums. The first one we checked out was the Vapriikki Museum. It was only a 15 minute walk from the train station, and we found it easy with the help of Google maps. When we searched the museum online we were immediately interested in a part of the Museum, Finnish Games. This was really cool for us; we didn’t know Finland had so many classic games made there. We had saw, played and explored the history of Finnish Games. One of the latest games that was made was Quantum Break for Xbox and PC, I was caught by surprise when I tried the demo that an Irish actor is featured in it, Aidan Gillen. We explored the museum more; it was great and really enjoyable. The other parts we saw were the Natural History, Mineral Museum, Tampere 1918 and Tammerkoski Rapids and the story of Tampere. Next we checked out was the Moomin exhibition in the Tampere Hall. This is definitely a highlight of the trip to Finland. Upon entering the exhibition we were kindly greeted by one of the exhibition staff members who kindly told us the route and some information. The creator of the Moonins, Tove Jansson had an interesting life from the information books we were given, the exhibition showed official artwork and gave details on each book. There were dioramas that were spectacular to behold and we recommend anyone with free time in Finland to check it out, for the whole journey was memorizing. Unfortunately we could not take pictures due to copy right issues; we were only allowed to take pictures at one area. On the Sunday, Amy had travelled to Turku to meet friends of hers that are living in Sweden. They had arranged to meet in Turku for the day, their day included sigh-seeing and a walk around tour of a boat museum. 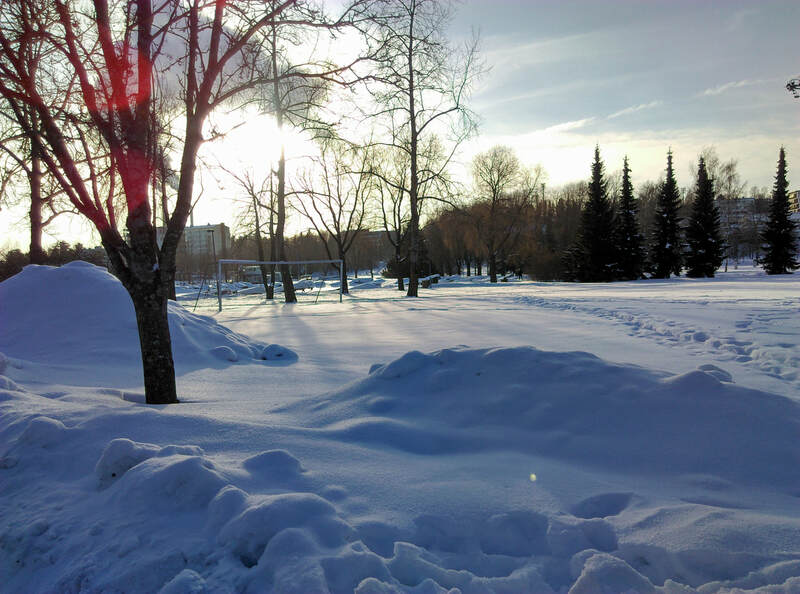 Here in Pori we had a more relaxed day; we checked out the snow covered park nearby and went for a stroll. Monday morning we travelled to Villila College to work on our board games, we are making progress. My groups idea is coming along nicely with now fleshed out game rules and mechanics. Also our GTI teacher Jon had arrived with his Film and TV students, they’re going to be in Villila College for 3 weeks. It was really nice to see a familiar face from Ireland, we will be talking and hanging out with Jon and his students while we are all here in Pori.